With a background in the classroom and the state legislature, Montana Superintendent Elsie Arntzen is working to build on her experiences and relationships to elevate and engage teachers in state policy. “Championing, supporting, and celebrating teachers is important work for the state,” she says. To achieve this goal, Arntzen worked with CCSSO to enhance the Montana Teacher of the Year (MTOY) Program. This transition offered Montana a great opportunity to think anew about its program and participate in a CCSSO pilot that helps states examine and strengthen state programs. Last fall, a team from CCSSO visited Montana and engaged over 40 education stakeholders in focus group interviews to identify priorities for the MTOY Program. The interviews centered on the elements of strong Teacher of the Year Programs: leadership with a vision; a rigorous application and selection process; recognition and meaningful opportunities for teachers; building partnerships; providing resources and supports; and developing a communications strategy. Pulling the aggregate feedback from the stakeholder interviews, CCSSO developed recommendations for the Montana Office of Public Instruction to implement over a 90-day period. Since this visit, Arntzen and her team established a mission for their program, “to elevate student success by empowering classroom innovation and enhancing pathways to teacher leadership,” and have started work to rebuild the program. A priority for Arntzen is to expand the recognition of teachers. To do so, the Montana Office of Public Instruction is developing awareness throughout the state about the opportunities for teachers to be recognized through this program via individual outreach to district superintendents, monthly communications to districts, and engagements with teacher and parent organizations. Arntzen is also seeking a broader base of volunteers to serve on Teacher of the Year selection committee. This expansion of the selection committee serves multiple purposes — ensuring the selection process recognizes a diverse group of expert teachers, creating opportunities to grow their State Teacher of the Year Program, and building partnerships with other champions of the vision. Champions of the program are formed when individuals are exposed to the high caliber candidates for State Teacher of the Year as members of the selection committee. A next step the state is planning is to expand the celebration of teachers with recognition of ten Regional Teachers of the Year with an open nomination process. This process will ensure geographic and cultural diversity as teachers from the nine geographic regions of the state and an American Indian educator will be identified through a partnership with the Montana Indian Education Association. Arntzen is committed to elevating the voices of teachers and increasing the prestige of the teaching profession in Montana throughout her tenure as chief. She is working with her team to establish a strong foundation for the program within the agency. 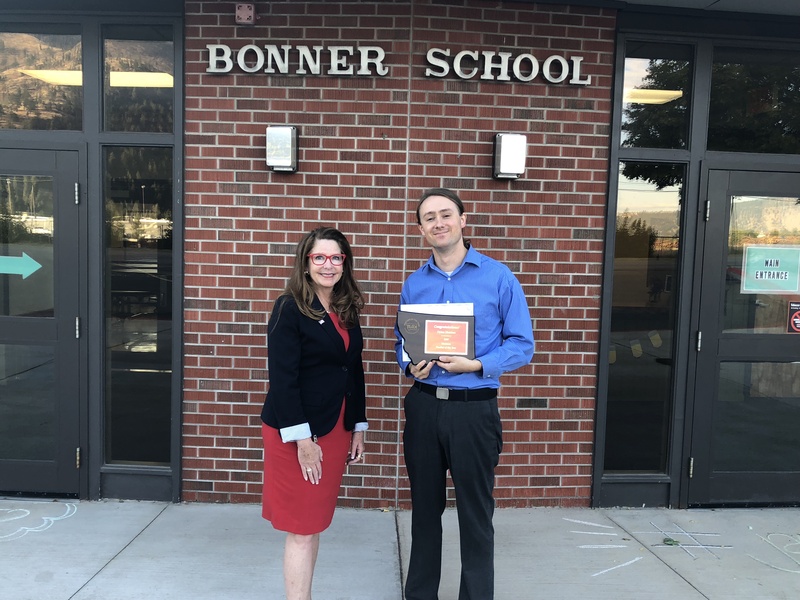 Following the pilot program, Montana’s Office of Public Instruction submitted its first State Teacher of the Year, Dylan Huisken of Bonner, to CCSSO for consideration for the 2019 National Teacher of the Year process this fall. “I encourage other chiefs to seek the guidance CCSSO provides to support Teacher of the Year Programs. Their guidance paired with dedication and hard work from our team put us on the right track,” Arntzen said. Through a new grant from Voya Foundation — the charitable giving arm of Voya Financial — CCSSO is excited to provide support to five additional chiefs to enhance their State Teacher of the Year Programs. The District of Columbia, Florida, Iowa, New York and Ohio will participate in the next round of Teacher of the Year Program Supports, as a part of CCSSO’s commitment to ensuring all students have access to effective educators. For more information about Montana’s program work or to express interest in future state work, contact Emily Zevely, Director of Educator Engagement.